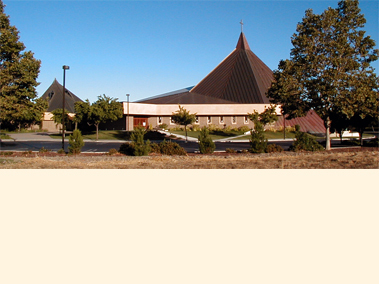 The Main Church of the Parish represents the second completed element of a Master Plan by Aaron G. Green Associates. It is primarily hexagonal in plan form, 15,000 sqft. in size and seats 800 individuals. Flanking side wing appendages containing service and utility spaces. The hexagonal base is constructed entirely of integrally colored split-face concrete masonry to the underside of a deep cement plaster overhang. A corresponding hexagonal shallow dome, copper sheathed, covers the main assembly space. The dome is intersected by a tall, eight-sided pyramidal form, also copper-roofed, and both split open down the center by a broad, translucent skylight. As experienced from the interior, the diffused daylighting dramatically highlights the center of liturgical action and presentation. The altar directly below is bathed in pleasant, natural light which is shared as well by the 800-seat nave. The congregation seating virtually surrounds the altar, in a “theatre-in-the-round” arrangement according to post-Vatican II requirements. All members of the congregation have clear site lines to the altar and thereby develop a connectedness to one another and the celebrant. A strong linear axis is maintained through the center of the Church, from entry from the lobby to the choir area opposite. This allows the celebrant a high degree of flexibility for liturgical furnishing arrangements in front of the congregation, but most of all, the opportunity to incorporate movement, particularly processionals. A full-immersion baptismal, constructed of precast concrete and lined with glass mosaic tile was designed by the architects, in additional to flanking internally-lit glass and wood special cabintets integrated into the adjacent columns (to house related liturgical accessories). Windows to the exterior were designed with precast concrete surrounds. The architects also designed the entry identification signage of precast concrete. A large, original bronze sculpture was commissioned of, and executed by, Heloise Crista of the Frank Lloyd Wright Foundation. It depicts St. Elizabeth Seton in a protective embrace of children and is placed prominently over a water pool at the base of the copper pyramid.